Clemson Girl: Loose Lucy’s has fun and funky fashion for gameday – Clemson Girl readers get 20% off!! 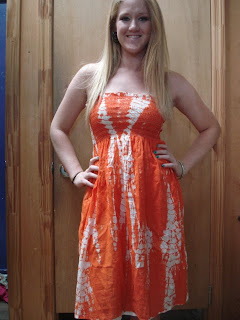 Loose Lucy’s has fun and funky fashion for gameday – Clemson Girl readers get 20% off!! Two Saturdays ago when I was in Clemson for the Clemson vs. TCU game, I was walking downtown and noticed a booth set up with some really cute tie-dyed dresses in Clemson colors. 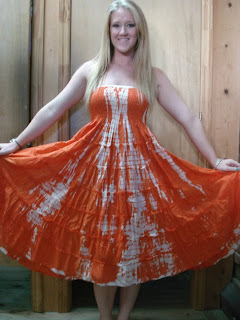 I especially took notice of a one shouldered, orange and white tie dyed dress. The booth was for a fun and funky store called Loose Lucy’s. Unfortunately, I was in a hurry and didn’t have time to stop by. Throughout the day several of my friends mentioned this same booth to me, saying “You’ve got to put them on Clemson Girl!” So when I got an email from Loose Lucy’s this week, I was super excited for the opportunity to share this great store and their products with you! Loose Lucy’s manufactures their own women’s and little girls' Clemson apparel, as well as tie dye Clemson t-shirts for your little ones, or even your Clemson guy. They make all types of apparel including dresses, skirts, hoodies, and children’s dresses – and they are all super affordable, ranging in the $20 to $30 price range. Loose Lucy’s is all over campus on home football games – you can find them in front of Mellow Mushroom, in front of the Fast Point convenience store, and downtown in front of Winkopp Reality, next to Moe’s. They will be there from 9 a.m. until the crowds die down – so make sure you stop by and visit one of their booths this weekend! Dresses - One request I often hear from readers is to feature more gameday apparel that will fit and flatter any body type. Well, here comes Loose Lucy’s to the rescue! Most of their dresses are one size fits all – so regardless of your size, the super comfortable dresses will form to your body type. 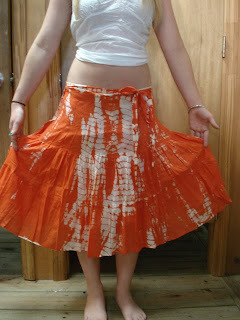 Skirts – Loose Lucy’s also has these awesome skirts – available in orange and white tie dye, orange and purple tie dye, or solid orange. These look so comfortable and are again, one size fits all – so they will stretch to your size (even if you eat too much at your tailgate). :) You can get them in a variety of lengths…from knee length all the way to ankle length. 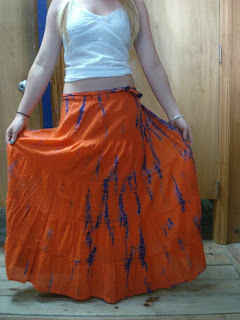 And really…what Clemson Girl can resist a flowy skirt. Pair one of these with a white tank top and a pair of flip flops for a comfortable, but stylish, gameday outfit. If I was still a student at Clemson I’d probably wear this skirt every day to classes. Gameday tops – The weather will be a little cooler in October at the home games, but not cold enough quite yet to bundle up. This purple and orange tie dyed top from Loose Lucy’s would be perfect (and so cute) with a pair of jeans and flip flops for early October games. I like how it’s breezy and flowy, but has a tie right under the bust so you can fit it to your size and give it a shape. Wear it over a white, orange, or purple tank top and dress it up with funky Clemson jewelry. The great thing about Loose Lucy’s is that they have 7 locations! So, there’s bound to be a Loose Lucy’s close to your neck of the woods. However, if not, you can easily browse and purchase any of their items by visiting their Web site http://www.looselucys.com/ (free shipping on orders of $75 or more!). If you have any questions about any of their products, or would like to place an order by phone, call Loose Lucy’s at 843-853-8233, or contact them by email at looselucys@hotmail.com. Don’t forget to visit Loose Lucy’s this weekend – you can find them in front of Mellow Mushroom, in front of the Fast Point convenience store, and downtown in front of Winkopp Reality, next to Moe’s. They will be there from 9 a.m. until the crowds die down. SPECIAL CLEMSONGIRL.COM OFFER!! Loose Lucy’s would like to offer all Clemson Girl readers 20% off of their purchase as a special this weekend for Clemson Parents Weekend! Mention at any of the Loose Lucy’s booths this weekend in Clemson that you heard about them on Clemson Girl OR put ‘Clemson Girl’ in the comments section of the order form when purchasing on their Web site and get 20% off! How awesome is that? Thanks Loose Lucy’s! So I hope everyone at least makes a point this weekend to stop by one of the Loose Lucy’s booths and check out their Clemson apparel – I’m getting that one shoulder dress..even if I do have to walk there in the rain to get it! I have a question - I would LOVED to see what the one shoulder dress looks like - I don't live in the Upstate - are these styles available in all the stores?